The ‘It’ factor, it is often said, can never be truly defined. We simply know that some people have it and others don’t. Identifying and appreciating its components is another matter and can prove a devilishly difficult task. At some time or another, we have all seen a fighter whom we know to be great without initially knowing why. We tend to keep quiet about this, of course. When you make your living on the boxing beat, it doesn’t do to go around asking others to enlighten you. The average fan, by contrast, is a more innocent and admirably courageous animal. I must admit to having quite a high regard for the fellow who posted the following question on one of the Internet forums: WHY WAS CARLOS MONZON SO GREAT? My admiration for this honest soul might surprise you, since I happen to be one of Monzon’s greatest boosters. At first glance, the question might seem akin to asking what Joe Louis ever did that was worth a spit. But I understood the nature of the query because it took me back to my teens when I watched Carlos Monzon for the first time. What did I see then through my youthfully innocent eyes? And what did I fail to appreciate? Let me say right off the bat that I recognised the tall and sinewy Monzon as a very strong and tough fighter. Beyond that, I wasn’t sure. I didn’t see a man who would reign as the middleweight champion for seven years, make fourteen defences of his crown and methodically pummel a succession of top quality fighting men to the point of significantly shortening their careers. There was a deceptive destructiveness to Monzon’s work, a cold and sometimes cloaked manner to his executions. He would batter technically superior and more mobile opponents into submission without fuss or frills or any sense of the melodramatic. You would see the evidence, assimilate it to the best of your ability and still come away asking yourself how exactly he did it. Not to put too fine a point on it, there were times when Carlos Monzon looked downright ordinary when viewed through a strictly technical eye. Perhaps that is what threw so many people in the early days and what continues to throw the new generation. Jim Jeffries and Rocky Marciano, two of history’s other great indestructibles, were similarly unremarkable in that respect. But the fireworks from Jim and Rocky were loud and bright and wholly visible. Monzon’s arsenal of weapons could be as understated and deceiving as his permanently impassive expression. Fighters got bashed and bludgeoned by Jeffries and Marciano. Against Monzon, they got coldly hammered. If you can’t spot the difference, you never will. Monzon was awkward and ungainly. He was very upright. He wasn’t fleet of hand or foot and was often very often robotic in his movement. He didn’t possess the skills of Sugar Ray Robinson, the whirlwind place of Harry Greb or the explosiveness of Marcel Cerdan. What exactly was it, then, that set the powerful Argentinian apart from most others? Historian Ted Spoon makes a very pertinent point when he says, “Fans are always displeased with fighters who seem so against the grain in comparison to the ideal pugilistic textbook. We watch a Joe Louis highlight reel and conclude that the guy did everything by the book, but there have been numerous ‘authors’ throughout history whose work is yet to be understood. Monzon is just another. 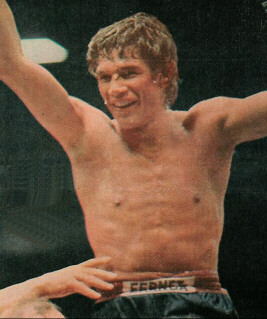 “Monzon had a great fighting discipline and a unique deceptiveness. Everything he did was done with purpose, never half-assed, and the slow and pushy nature of his punches confused until they hit home, hard. “His rock solid, beanpole body was an impossible obstacle. Monzon only needed to creak back that 6’ 2” frame in order to evade the most stretched of efforts. “A feature synonymous with Monzon was his ability to half-punch. Sometimes, if a punch was going to fall short, he would leave his arm in its half recoiled state, only to pump it out when back in range. These subtle tricks, whether intentional or just bizarre characteristics of his methodical style, left fighters guessing. A bully boy, yes, but certainly not the stereotype bully who turned tail when the other fellow hit him back. Monzon was no less tenacious and implacable in the face of adversity. Carlos proved repeatedly that he could win his fights in any fashion. He was a commanding front-runner who couldn’t be shifted or derailed once he was steaming. There are few things that sap the morale of an opponent more than knowing from the start that the most he can achieve is to keep the deficit respectable. In his coronation war against Nino Benvenuti in the cauldron of Rome in 1970, Monzon stuck to his task with the chilling doggedness of a lion bringing down a zebra. He grew in strength and determination as the rounds wore on in an engrossing and exciting fight. Nino must have wondered what he had to do that night to quell his seemingly unbreakable challenger. Sensing his championship was slipping from his grasp, Benvenuti launched powerful rallies in the ninth and tenth rounds, in which his vaunted left hook found Monzon’s jaw repeatedly. I couldn’t believe how little effect those blows had on Monzon. A year earlier, that same left hook had knocked Luis Rodriquez cold in eleven rounds. Four years before that, it had wrecked another tough man in Sandro Mazzinghi, who was put to sleep at the San Siro Stadium in Milan. Monzon appeared impervious to such punishment as he kept firing back and finally broke Nino’s resistance in the twelfth round. A terrific right cross to the jaw was the coup de grace. California Hall of Fame member, Hap Navarro, matchmaker at the old Hollywood Legion Stadium between 1953 and 1955, has seen some terrific fighters in his time. Of Monzon, Hap says, “To me he was like another great middleweight champion, Freddie Steele, without the footwork. A wiry, somewhat raw-boned hard puncher who could take it. Not the difference in physique: Cerdan vs Steele or LaMotta vs Monzon. “Steele was a gangly sort as a fragile welterweight at the start of his pro career, long before he hit it big. But he could box with the best and had a devastating punch. Check out the film of his two-round annihilation of a rising Gus Lesnevich. “I would also parallel Monzon as being a stronger, rangier edition of Roberto Duran, without the overly bellicose attitude that so characterised Roberto. “You know the type. Fearless, confident, with a genuine affinity for confrontation – let the devil take the hindmost. Whenever I go back and replay the films I have of Carlos Monzon, so another hidden jewel is revealed beneath his many layers. He truly was the laconic gunslinger of the ring, a wonderful fighter. As I watch him winging his thunderous punches at a succession of reeling opponents, the irresistible force of the man they called Escopeta (Shotgun) seems even more potent than it did during his long reign as middleweight champion. What a finisher Monzon was. Ruthless and incessant, full of controlled fire and ice. He just kept throwing punches when he had his man on the hook, yet never with reckless rage. The fire was confined to his fists, the ice controlled his brain. The punches were thrown coldly and deliberately, immense blows that sometimes missed the target but more often hit home with shuddering effect. At the heart of the killing machine was an extraordinary self-belief and the perfect balance of arrogance and discipline. It was as if the gods themselves had told Monzon he could not be beaten, mapped out the perfect game plan for the chosen one and then flicked the switch that set him in motion. No showboating, no gimmicks, no peripheral nonsense to clog the wheels or stall the engine. Just a tireless, ruthless, super efficient machine that ran and ran. One man who got a personal impression of Monzon’s sense of destiny was the prolific fight writer Graham Houston. When Monzon was the king of the middleweights, Graham reigned as the editor of the world’s longest running boxing publication, Boxing News, in London. The fight game has been in Graham’s blood since I don’t know when, and he would take a plane, train or automobile to any battle he could get to during that golden era. He brought his readers vivid, first hand accounts of the great middleweight talents of the time, including Rodrigo Valdez, Bennie Briscoe, Tony Mundine, and that wildly exciting banger, Jean Mateo. But it was Monzon who inevitably stood out in Graham’s mind, as much for the almost mystical aura that accompanied the iron will and the iron fists. “Monzon was of course a big, tall middleweight and he controlled the distance very well, with his long left setting up the heavy right hand. He was very good at keeping the fight at the range he wanted and he had an outstanding chin. I recall Gratien Tonna hitting him with a huge left hook in Paris and Monzon hardly blinked. I think it took all the confidence out of Tonna, who was a very strong guy. He basically quit in the fifth when Monzon started opening up on him. “There was an arrogance, even an insolence about Monzon. He carried himself like a winner. I was in the office of the promoter, Rodolfo Sabbatini in Rome with my wife of the time when Monzon strolled in, impeccable in a white suit, bronzed skin, smoking a cigarette, looking as if he had walked in off the set of a Federico Fellini film. “He was a very cool looking guy and obviously a man absolutely full of confidence. He was one of those boxers who entered the ring as if he KNEW he was going to win, just a matter of how he did it. “Although very good at long range, Monzon could bring up shorter punches. My memory tells me that he really hurt Jose Napoles with a right to the body in Paris. Although that fight was officially stopped because Napoles was cut, believe me, Angelo Dundee was glad to get his guy out of there because Jose was starting to get destroyed. “Monzon was very good at coming right back when his opponent seemed to be doing well. It was very hard for a boxer to take charge of the fight with Carlos. I also recall how cool and collected he was when he was dropped by Rodrigo Valdez in their rematch, when Monzon was also cut along the side of the bridge of his nose. “He never looked particularly flustered or disorientated as I recall, although he had been hit flush by the guy who had blasted Bennie Briscoe. Monzon’s stamina was probably his most impressive and illogical asset, since he was ever bit as proficient as Stanley Ketchel and Harry Greb at taking the rule book and throwing it out of the window. Ketchel invariably whiled away his leisure time by drinking and whoring out on the old Barbary Coast. Greb was a walking encyclopaedia on the best nightclubs and pool halls in any given town. Monzon kept his body beautiful in trim by resting it horizontally against any passably attractive woman and by blow-torching his lungs with up to a hundred cigarettes a day. His nicotine intake would decrease by an impressive fifty a day when he got down to serious training, including a few smokes on the run to relieve the tedium of roadwork. Other rebellious aspects of the younger Monzon’s make-up couldn’t be left to look after themselves. The miracle of his control and steady temperament in the ring was that he was an eternally volcanic and volatile man in the living of everyday life. His handlers could only ever bank the fire in his soul, which burned from his youth to his premature death at the age of fifty-two in a car crash. As a youngster, Monzon served brief jail terms for starting a soccer riot and brawling on a bus. He was still up to his old tricks in his early days as a professional boxer when he supplemented his low earnings by pimping. Carlos never did stop walking on the wild side and certainly never found the secret to controlling the raging temper that he mastered so well within the roped square. When that temper finally boiled to overload, he threw his second wife Alicia Muniz to her death from a balcony. What is it about boxing that enables a man like Monzon to park his general indiscipline in the closet and become the ultimate control freak in a make-or-break situation? Like a junkie jacking up on his favourite brew, the Argentinian enigma would suddenly become a model of reliability for the duration of a fight. He wised up to his foolish ways very quickly after a painful lesson in 1964. His manager, Amilcar Brusa, sent him down to Rio de Janeiro in Brazil to fight a tough cookie called Felipe Cambeiro. Badly prepared and outside his native Argentina for the first time, Carlos was decked three times in a humbling points defeat. He sucked up the harsh lesson and lost only once more in his remaining 86 fights over the next thirteen years. Whenever I study and assess the great middleweights, Monzon stands out as the man who could cope most effectively against all styles of opponents. He was excellent at maximising his many strengths and masking his weaknesses to the point where they rarely inconvenienced him. Tall and powerful, rangy and iron-chinned, Monzon was a destructive and debilitating hitter. The big blows often looked slow and ponderous, yet the damage they did was to drain the resistance and virtually terminate the top level careers of so many of his opponents. His pole-like jab alone must have felt like a concrete post as it rammed into an opponent’s face. Carlos was a slow starter but always able to weather early storms. He was frequently stunned but so infrequently hurt. On the rare occasions he was floored, he would bounce straight back up like a yo-yo, as if his computer-like mind was programmed to believe that such incidents were no more than aberrations. Like all great champions, Monzon had his pedestrian nights and close calls, yet always there was that frightening sense of inevitability about him. Old sage Emile Griffith fiddled Carlos about and almost pipped him in their second meeting in 1973, after being stopped in the fourteenth round of their first engagement. Clever Denny Moyer made Monzon look awkward in carving out an early lead, but was floored, swollen and all done after five rounds of draining power and pressure. Jean-Claude Bouttier, the skilful Frenchman, twice attempted to navigate his way through the Monzon minefield, but was pulverised to defeat in their first fight and suffered a bruising points loss in their second. Hard man Bennie Briscoe went iron for iron and will for will against Carlos and was soundly beaten. The talented but fragile Tony Mundine and the dangerous but crude Gratien Tonna were meat and drink for the Argentinian powerhouse. Monzon’s two-fight career finale was almost perfectly scripted, as he captured thrilling decisions over the greatly talented and hard-hitting Colombian ace Rodrigo Valdez in Monte Carlo. In their second fight in 1977, Carlos was decked in the early going by a terrific right, stunning ringsiders by his almost nonchalant reaction to it. There was a quite audible gasp from the crowd when he hit the floor, and a similar intake of breath when he immediately got to his feet. I remember wondering at the time how that must have shaken the confidence of a man like Valdez, who had shattered the seemingly impregnable Bennie Briscoe with a single shot. Even under siege, Monzon retained his impassiveness. One wondered if he had crocodile blood running through his veins. One would need to write a book in order to do justice to comparing a fighter of Carlos Monzon’s calibre to his fellow all-time greats. In being brief, there is always the fear of sounding a little shallow and doing all fighters concerned a disservice. For one thing, we cannot include them all, so let us look at the men whose names are mostly mentioned as the top dogs. I could comfortably go on forever about the multi-talented Sugar Ray Robinson, but it is important to remember that Ray was already a fading genius when he stepped up to middleweight. It is a testament to what he had left that he still won the middleweight championship five times. But he lost it three times too to Randy Turpin, Gene Fullmer and Carmen Basilio, who were not comparable to Monzon in overall talent, class and power. Robinson, like the ageing Ali, increasingly needed to pace himself and call on his vast box of tricks during his middleweight reign. Basilio and Fullmer beat him with constant pressure, and neither man hit nearly as hard or as damagingly as Monzon. Basilio commented that Ray was ‘so damn tall’ at just under six feet, but Monzon was six two. Carlos wouldn’t have knocked Ray out, because nobody ever did that. I also think it is quite possible that Robinson would have surprised Monzon with a flash knockdown in the early stages, but I believe that Carlos would have pounded out a points win. In my view, the two men who would have given Monzon his toughest fights were Stanley Ketchel and Harry Greb. Both men shared Carlos’ incredible stamina and sheer bloody-mindedness. Both were similar ‘forces of nature’, to borrow a somewhat over-used term. Ketchel, the great Michigan Assassin, would have been considered a freakishly hard hitter in any era. His power of punch was truly exceptional, as he stormed to 49 knockouts before his violent death at the age of twenty-four. Often dismissed as a crude banger by current critics, Stan was much more than that. His attacks were woven with tricky body shifts, and while he preferred to launch his power shots from a distance, he was a demon at infighting. He simply never stopped punching as he switched his onslaughts from head to body. Modern technology has proved that Ketchel’s punch rate was comparable to the fighters of today. He and Joe Thomas maintained a ferocious pace in their epic encounter in 1907, in which Stan knocked out Joe in the thirty-second round. Ketchel, however, could be quite easily hit and wouldn’t have found it easy to get inside Monzon. All the time, Carlos would have been drilling the rushing Assassin with those hard and straight punches. A very difficult fight to call, and the agreed distance would have been an important factor. Over the traditionally accepted 15-round distance for all-time fantasy fights, I would have to give Monzon the edge. Harry Greb would have been another bundle of trouble for Carlos. Fast, furious, constantly tossing blows from all angles, the Pittsburgh Windmill wouldn’t have conceded Monzon much breathing space. Much is made of Greb’s paltry knockout percentage, but to describe him as a light or fluffy hitter is to blindly ignore the reams of evidence to the contrary. There are different ways to skin a cat, which is what Greb very nearly did to light-heavyweight great Jack Dillon in their Toledo fight of 1918. Jack came out of that one looking like a man who had been tossed head first into a threshing machine, his nose barely still attached to his face. To my knowledge, Dillon didn’t offer the opinion that Greb couldn’t hit. But we know that Harry could be out-hustled and outboxed. Mike O’Dowd, the St Paul Cyclone, beat the younger Greb at his own rough game when he got the better of their no-decision fight. Gene Tunney, after a baptism of fire, learned how to box Harry by keeping him at distance with skill, precision and a cool head. Monzon, I sense, would have utilised his natural power and canny boxing brain to survive some intensely uncomfortable moments against Greb and prevail in what would surely have been a hectic battle. Mickey Walker, the Toy Bulldog, was a tough and gloriously exciting fighter, blessed with astonishing durability. A terrific body puncher, Mick saw off every opponent of equal weight in his prime and was never beaten as middleweight champion. But surely his only way of defeating Monzon would have been to knock Carlos out, a feat never achieved. Monzon would have matched Walker for strength and also possessed the sounder defence. The likely outcome would have been a punishing but convincing decision for Monzon in a barnburner of a fight. I had all the time in the world for Marvin Hagler, having championed his cause in those dark days of the late seventies when he seemed to be the leading contender for an age before getting his shot. But I don’t believe he would have beaten Monzon. Little things stick in your mind about certain fighters, and I recall how tentative and uncertain Hagler seemed in his cautious victory over Roberto Duran. Roberto was very similar to Monzon in his brazen confidence and fiery attitude. Duran intimidated opponents, and I have always believed that he and Ray Leonard were the only fighters who were able to plant the seed of doubt in Marvin’s mind. Monzon was a very deliberate animal in his nature but he could always find a Plan B when the need arose. Hagler was less flexible in this regard and didn’t seem able to fully commit himself to an alternative game plan. My gut instinct tells me that Monzon would have forced Hagler up a blind alley and prevented him from getting sufficiently untracked to save the day. The one man who might have unhinged even Monzon was the incredible Bob Fitzsimmons, an opinion that might surprise some of our younger readers. But the ring has probably never produced another man of such scientific boxing knowledge as Fitz, who possessed the withering power to put his theories into practice. That power didn’t diminish as he moved up the divisions. Fitz was the Bob Foster of the middleweights, a genuine physical freak and arguably the hardest one-punch hitter in history. He knocked out the 300lb Ed Dunkhorst with a single blow to the stomach. However, let us not get too worked up over such scenarios. The almost unique subjectivity of boxing means that we will never find the pot of gold that contains the definitive ranking of the greats. I would only say that where the middleweights are concerned, I wouldn’t feel too bad about riding shotgun with the Shotgun himself.